XML can be very verbose and seems to be old-fashioned, but the good part around XML is, that there is a hugh pile of standardized mechanics around it. To query XML documents you can use XPath, for transforming XSLT and for validation XML Schemas or in short a “XSD” (XML Schema Definition). A XSD is just a XML document itself that describes the your valid XML document tree. Because its just a normal XML document (with a fancy XML-namespace), you could parse it via the normal XDocument, but things are way easier for you when you look at the System.Xml.Schema-Namespace. 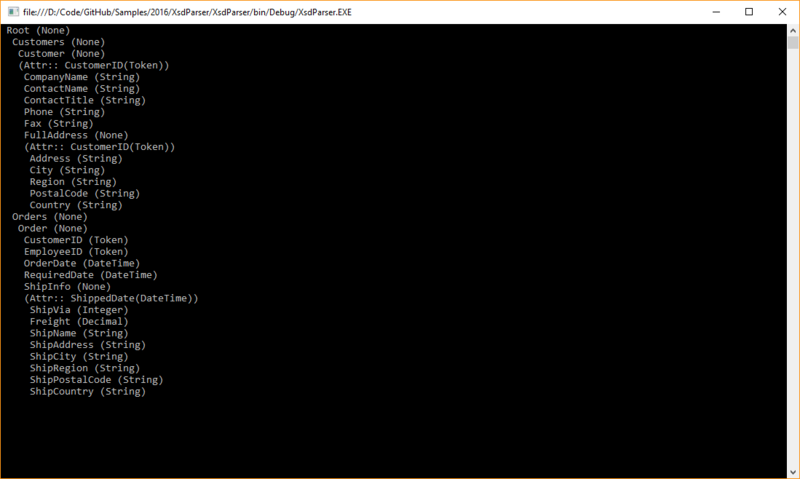 The basic code was taken from the MSDN and I added the recursive part to get all possible elements. // by iterating over the Schemas property. // of the Elements property. // Get the complex type of the Customer element. // and write each attribute name to the console. // Get the sequence particle of the complex type. // Iterate over each XmlSchemaElement in the Items collection. 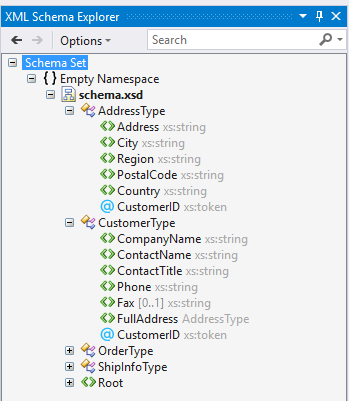 You should see the possible XML elements, attributes and their datatypes, but you have access to all specified schema information from the XSD that you want. XML namespaces are powerful, but can also be pretty complicated for everyone who needs to parse your XML. I guess you could put some evil XML namespaces inside the XSD and things will break with my code. Just be aware of this issue if you are dealing with namespaces. I discovered that Visual Studio ships with a pretty nice XSD editor. But you don’t need to craft the XSD by hand,there are many tools out there that can generate XSDs based on existing XML documents. I added the XSD Sample from the MSDN in the demo project. If you found an issue, just let me know.